You are here: Home > If There Are 9 Space Dimensions Why Do We See 3? If There Are 9 Space Dimensions Why Do We See 3? Why does our universe have three space dimensions? As if that question is not tough enough, string theory says that it has nine. So why do we see three? Some say there will never be an explanation, that it is just a “brute fact”. Others say this is one of the ultimate questions and that we should seek the answer. I share this view. There is a simple explanation, one that depends on a different brute fact. String theory is slowly turning into mainstream physics. Its math needs the world to have nine space dimensions if it is to work. Six of these dimensions are said to be compactified into tiny (Planck-scale) loops. This is needed to explain why we see only three dimensions. But theory doesn’t say how or when those dimensions compactified or why compactification picked on only six. It takes a seemingly simple question and turns it into something much more complicated. Some explanation! So instead of starting with string theory’s problems, let’s look at the object it ends up with. It’s a Planck-sized volume called a Calabi-Yau manifold, a quantum of space named after the two mathematicians, American Eugenio Calabi and British (now American) Shing-Tung Yau, who discovered it. It has six internal dimensions but they are so tiny we will never see them. Yet it is now one of the most studied objects known to physics and mathematics. Computer models try to depict it in 2D with images like this. In 1899 German physicist Max Planck calculated the Planck volume in a famous paper that won him a Nobel Prize. Speculation that Planck size might set a lower limit on the size of anything would slowly crystallize into serious theories over the next hundred years. Despite its clumsy concept of compactification string theory seems to be the most promising product to date. 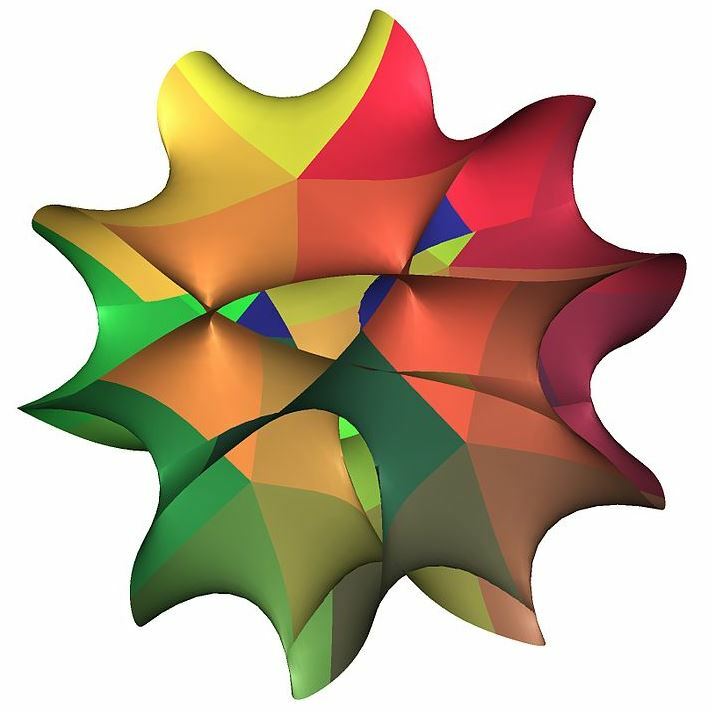 If these Calabi-Yau manifolds did not arise by compactification, where did they come from? Let’s begin at the beginning: let’s begin with one. This simple concept owes much to Belgian physicist Georges Lemaître. In 1931 he said if we count quanta backwards we will find a time when there was only one. So, as we count forward from the beginning, there are more than one. Each one has the Planck volume. Many of them have many times that volume. Writ large, they are making space in what I like to call the Big Fizz (no Bang is needed). We could say that the volume of space is a 3D property, but does this help us? The concept that space has three dimensions is something of a hangover from Euclid and Descartes. When one wants to define the position of a point in space one specifies a set of three coordinates relative to a frame of reference. But a few weeks ago readers saw how 3D physics may be done in 2D and even how every point in the universe can be described by a single number as its address. Thus the issue is not how many space dimensions there are in the universe. The issue is: What do we see and why so? What we see is not 3-D; that’s neither how our eyes see nor how our minds process reality. What we see is simply volume! So the reason that we see our world in what we call 3D is because space is made up of many quanta, each of which has volume. Each space quantum has six dimensions that we do not see because they are so tiny. As these quanta were compact from the beginning there is no need for “compactification”. Fine by me: it is an unlovely word. At last there is a solution to the elementary-charge problem and it turns out to be stunningly simple.